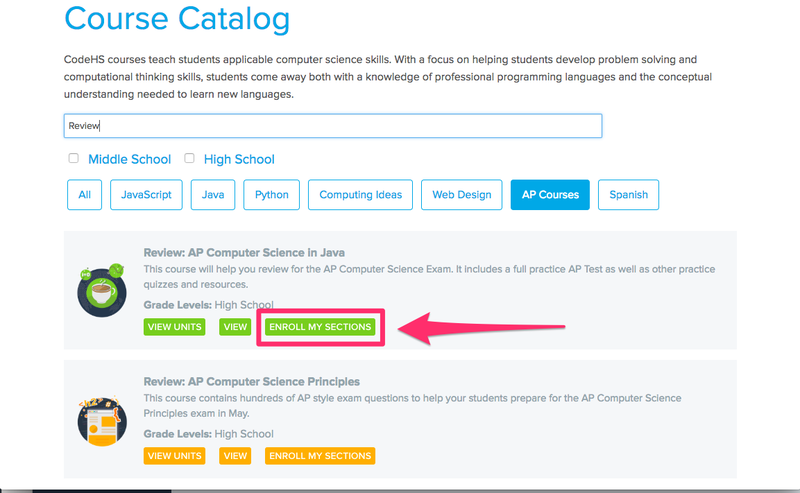 You can enroll your section in the AP CSA review course by going to “Section Settings” from your section homepage. From the Section Settings page, scroll down to Course and Playlist Enrollment and click “Add More Courses from the Catalog” button. This will take you to the course catalog, where you can then enroll your section. From the course catalog, you can scroll or search for the AP CSA Review course, and enroll your section in the course by clicking the Enroll My Section button. Students will then be able to access the review from “My Courses” on their student page. You can also get to the course catalog by going to codehs.com/course/catalog.